ART – Gaiety Theatre – Review by Frank L.
ART started life in the Comédie des Champs-Élysées in Paris in 1994. In 1996, following an adaptation and translation by Christopher Hamton, it opened in London with Albert Finney, Tom Courtenay and Ken Stott. It ran with various cast changes for 8 years. During that time it also had a New York life and in 1998 won the Tony award for best play. It was revived by the Old Vic in 2016 and it is this production which is now touring Britain and Ireland. The cast consists of three middle aged men who have known each for many years and meet frequently. Serge (Nigel Havers) is a successful medical consultant, with an unsatisfactory marital past. Marc (Dennis Lawson) thinks of himself as an authority on matters artistic and is happily married. Yvan (Stephen Tompkinson) is socially insecure and has a habit of saying something emollient. He is single but about to tie the knot for the first time. The play is set in each of the friend’s apartments in which each has a painting. Yvan’s is a still life of apples painted by a relative. Marc’s is an interior with a view receding into the distance which he considers to be art. Serge’s is an expensive piece of modern art; a white canvas on which to the trained eye there are some white lines. He is inordinately proud of it but Marc thinks it’s “shite” and Yvan’s view hovers somewhere between the two. However, the white painting ignites a blazing row between Marc and Serge into which Yvan becomes embroiled as the arguments leave existential questions about art in the mire and revolve instead around less esoteric subjects. The set consists of a smart apartment with suitable architectural designed chairs. The owner of the apartment is signified by the piece of art on display. A revolving back panel ensures throughout the change of apartment is carried out seamlessly. 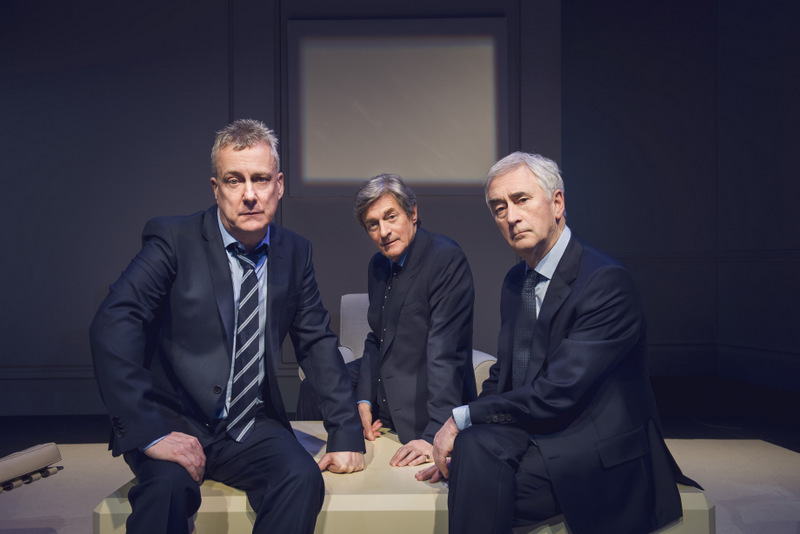 Havers, Lawson and Tompkinson each portray their characters with aplomb and deliver the highly comic text with bravura as it highlights their individual weaknesses rather than any strengths that they may possess. It all proceeds with high-octane but there are in particular two sequences which will remain in the brain; the first when Yvan loses his cool and has a five minute rant and the second, over a dish of olives, the three of them create a period of high social tension. Although the play is entitled “ART”, the art is only a sideshow. 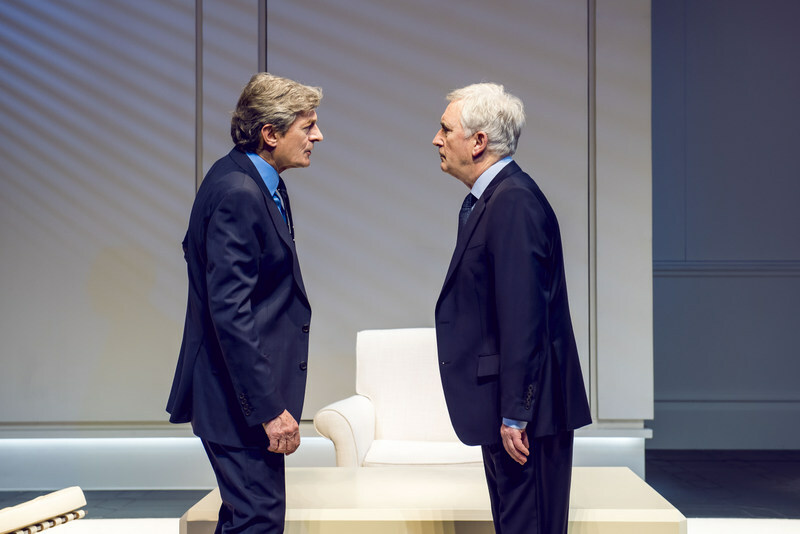 The play is about the tensions which underlie the friendship between three men who have known each other a long time. What makes them unusual is that their row is not engendered by the usual banter about football or rugby but by a painting. The work of art unleashes all sorts of hidden foibles and prejudices in each of them. 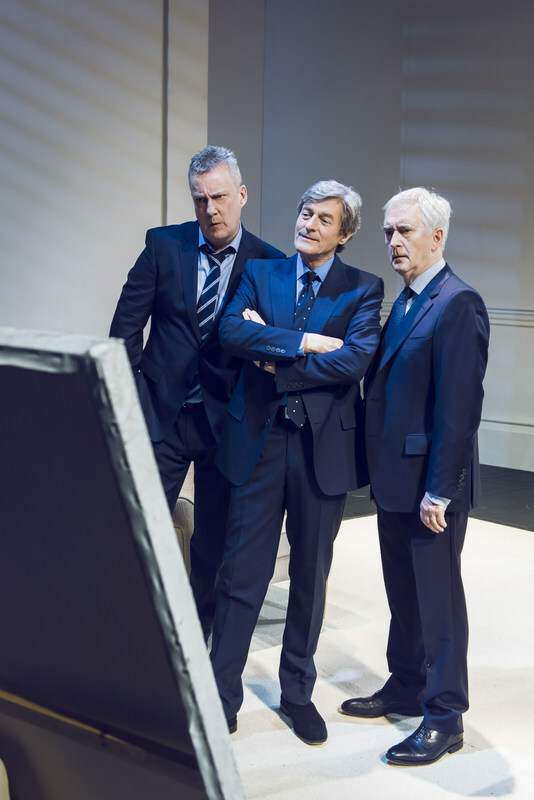 It is an inventive and energetic comedy, well executed by these three veterans of the stage.